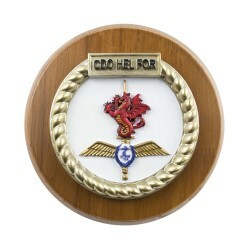 CDO HEL FOR - Commando Helicopter Force (CHF) unit badge, also known as a plaque or a crest.The Com..
RFA Mounts Bay ship badge, also known as a ship's plaque or a ship's crest.The Royal Fleet Auxiliar..
Glasgow and Strathclyde University Royal Naval Unit badge, also known as a ship's crest or a ship's..
Northumbrian University Royal Naval Unit crest, also known as a plaque or a badge.The Northumbrian ..
Yorkshire and Humberside University Royal Naval Unit badge, also known as a ship's crest or a ship'..
1st Raiding Squadron Royal Marines badge, also known as a crest or a plaque.The 1st Raiding Sq..
HMS Example ship badge, also known as a plaque or a crest.The HMS Example plaque features a sw..
Royal Marines Reserve (RMR) Merseyside unit badge, also known as a unit plaque or a unit crest.The ..
Royal Fleet Auxiliary Fort Victoria ship badge, also known as a ship's plaque or a ship's cres..
Royal Fleet Auxiliary Cardigan Bay ship badge, also known as a ship's plaque or a ship's crest.The ..
HMS Tracker ship badge, also known as a ship's plaque or a ship's crest.The HMS Tracker s..
HMS Ranger ship badge, also known as a ship's plaque or a ship's crest.The HMS Ranger shi..
HMS Cambria unit badge, also known as a ship's crest or a ship's plaque.The HMS Cambria unit b..
HMS Dalriada Royal Navy Reserve unit badge, also known as a unit plaque or a unit crestThe HMS Dalr..
HMS Blyth ship badge, also known as a ship's plaque or a ship's crest.The HMS Blyth ship's badge fe..
Gibraltar PBS - Gibraltar Patrol Boat Squadron badge, also known as a crest or a plaque.The&nb..
1 Assault Group Royal Marines badge, also known as a crest or a plaque.The 1 Assault Group Roy.. 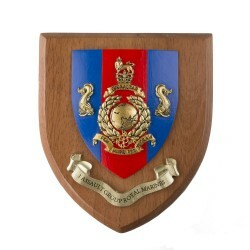 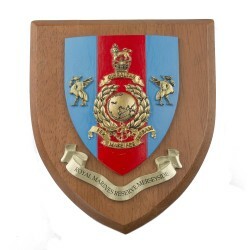 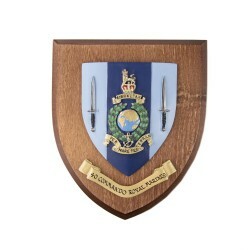 Commander United Kingdom Mine Counter Measure Forces crest, also known as a plaque or a badge. 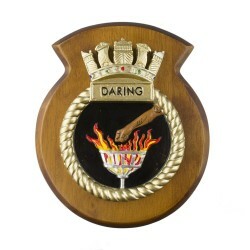 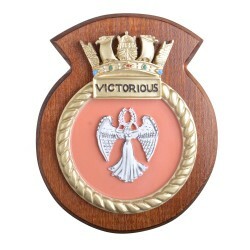 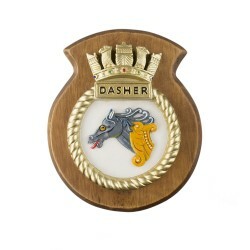 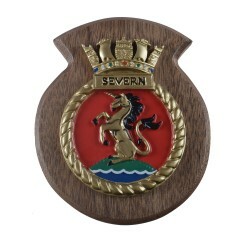 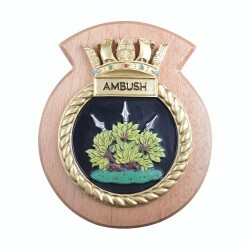 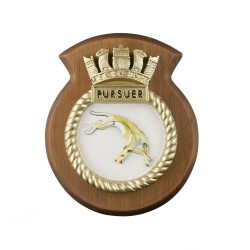 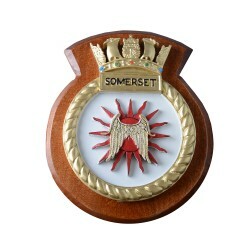 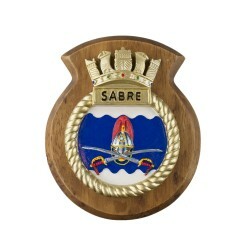 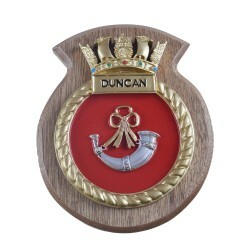 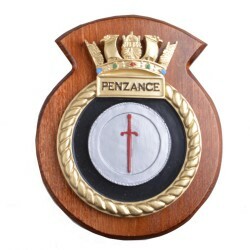 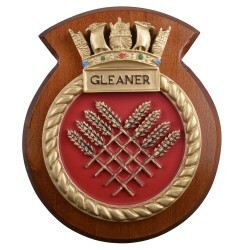 ..
HMS Pursuer ship badge, also known as a ship's plaque or a ship's crest.The HMS Pursuer s..
HMS Dasher ship badge, also known as a ship's plaque or a ship's crest.The HMS Dasher&nb..
HMS Sabre ship badge, also known as a ship's plaque or a ship's crest.The HMS Sabre ship'..
HMS Artful ship badge, also known as a ship's plaque or a ship's crest.The HMS Artful shi..
HMS Hibernia Royal Naval Reserve (RNR) unit crest, also known as a unit plaque or a unit badge.The ..
HMS Daring ship badge, also known as a ship's plaque or a ship's crest.The HMS Daring shi..
HMS Ledbury ship badge, also known as a ship's plaque or a ship's crest.The HMS Ledbury s..
HMS Cattistock ship badge, also known as a ship's plaque or a ship's crest.The HMS Cattistock&..
HMS Argyll ship badge, also known as a ship's plaque or a ship's crest.The HMS Argyll ship's badge ..
HMS Torbay ship badge, also known as a ship's plaque or a ship's crest.The HMS Torbay shi..
HMS Grimsby ship badge, also known as a ship's plaque or a ship's crest.The HMS Grimsby s..
HMS Iron Duke ship badge, also known as a ship's plaque or a ship's crest.The HMS Iron Duke ship's ..
HMS Diamond ship badge, also known as a ship's plaque or a ship's crest.The HMS Diamond s..
HMS Tyne ship badge, also known as a ship's plaque or a ship's crest.The HMS Tyne ship's ..
HMS Chiddingfold ship badge, also known as a ship's plaque or a ship's crest.The HMS Chiddingf..
HMS Collingwood ship badge, also known as a ship's plaque or a ship's crest.The HMS Collingwoo..
HMS Raider ship badge, also known as a ship's plaque or a ship's crest.The HMS Raider shi..
HMS Talent ship badge, also known as a ship's plaque or a ship's crest.The HMS Talent ship's b.. 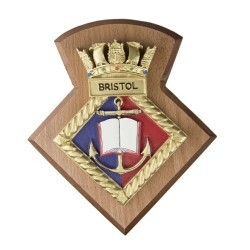 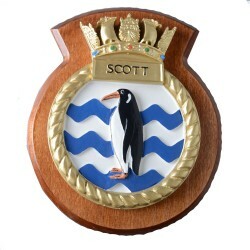 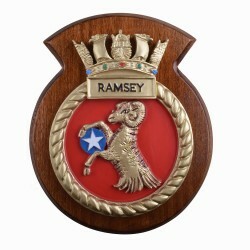 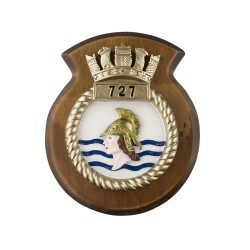 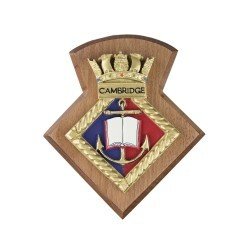 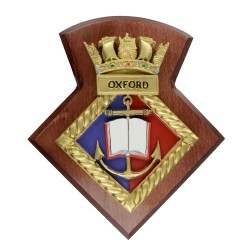 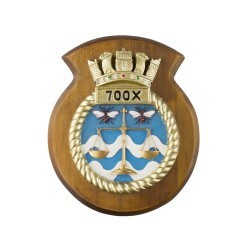 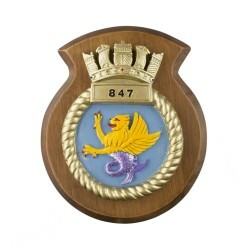 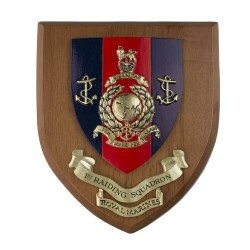 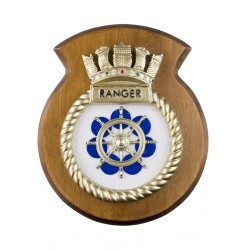 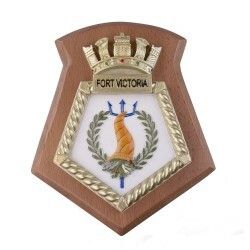 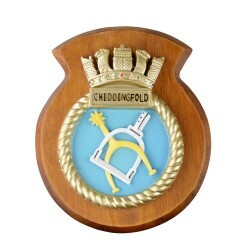 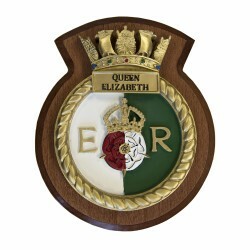 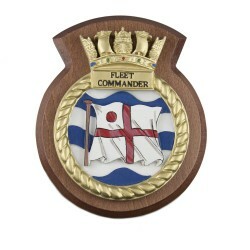 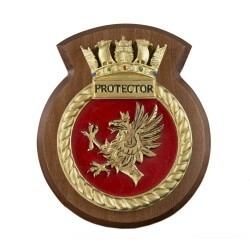 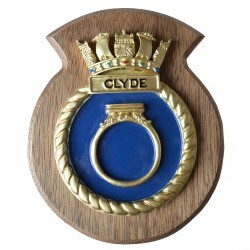 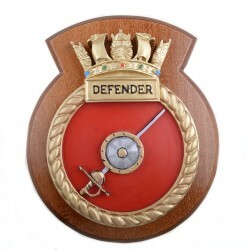 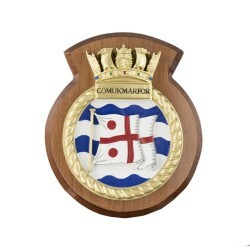 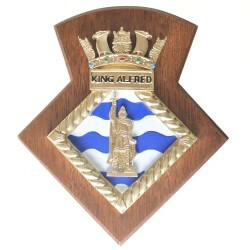 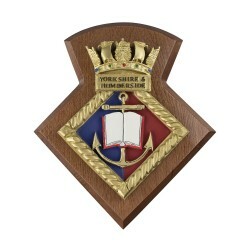 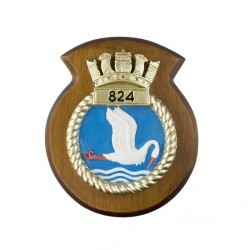 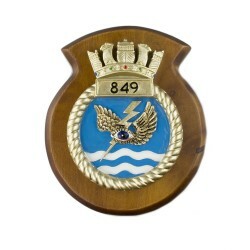 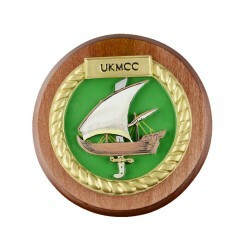 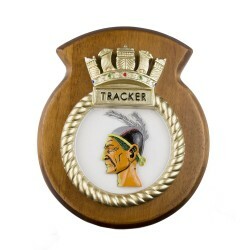 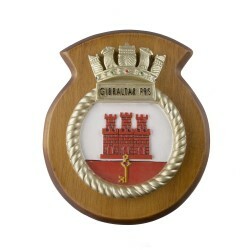 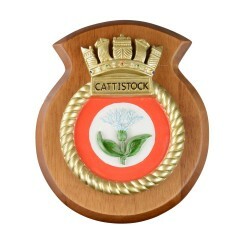 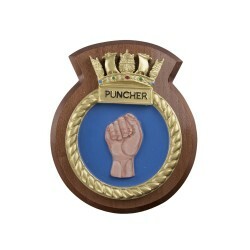 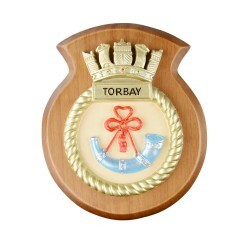 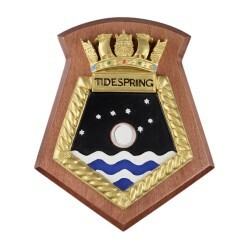 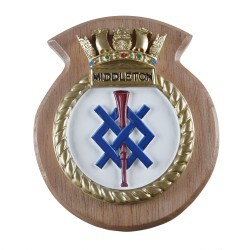 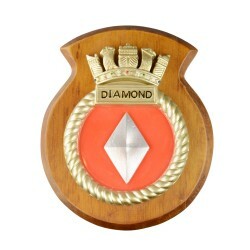 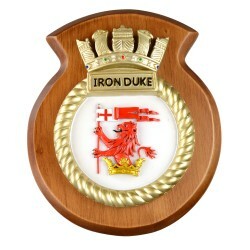 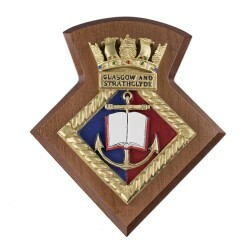 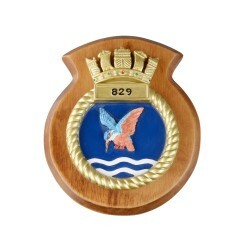 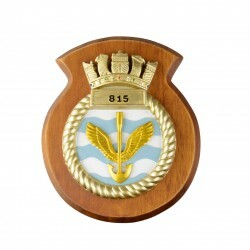 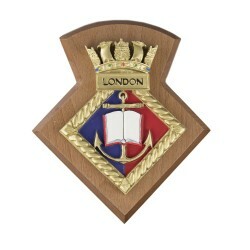 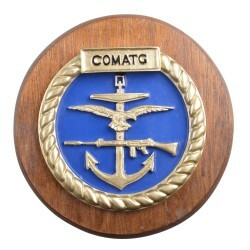 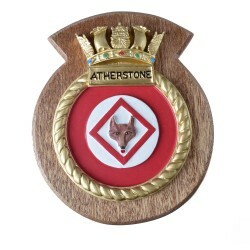 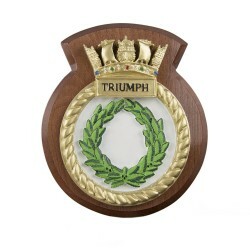 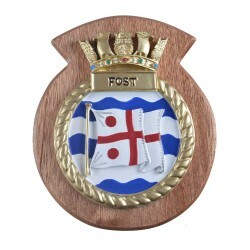 Commander United Kingdom Maritime Forces crest, also known as a plaque or a badge. 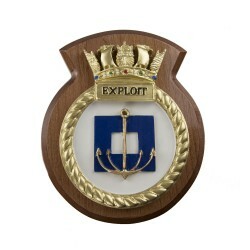 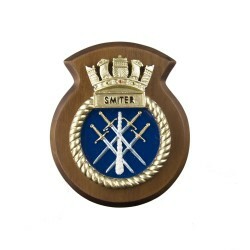 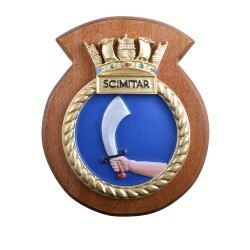 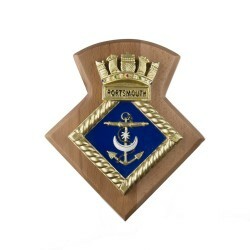 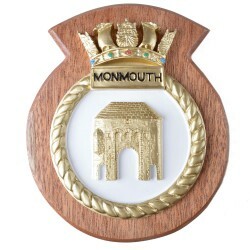 The Co..
HMNB Portsmouth unit badge, also known as a plaque or a crest.The Her Majesty's Naval Base Portsmou..
HMS Smiter ship badge, also known as a ship's plaque or a ship's crest.The HMS Smiter shi..
HMS Exploit ship badge, also known as a ship's plaque or a ship's crest.The HMS Exploit s..
HMS Prince of Wales ship badge, also known as a ship's plaque or a ship's crest.The HMS Prince of W..
HMS Puncher ship badge, also known as a ship's plaque or a ship's crest.The HMS Puncher s..
HMS Triumph ship badge, also known as a ship's plaque or a ship's crest.The HMS Triumph s..
HMS Queen Elizabeth ship badge, also known as a plaque or a crest.The HMS Queen Elizabeth ship's ba..
HMS Protector ship badge, also known as a ship's plaque or a ship's crest.The HMS Protect..
HMS Biter ship badge, also known as a ship's plaque or a ship's crest.The HMS Biter ship'..
Fleet Commander unit/ ship badge, also known as a plaque or a crest.The Fleet Commander unit badge ..
40 Commando Royal Marines unit badge, also known as a plaque or a crest.The 40 CDO RM units badge i..
London University Royal Naval Unit badge, also known as a ship's crest or a ship's plaque.The&..
Wales University Royal Naval Unit badge, also known as a ship's crest or a ship's plaque.The&n..
Edinburgh University Royal Naval Unit badge, also known as a ship's crest or a ship's plaque.The&nb..
Cambridge University Royal Naval Unit badge, also known as a ship's crest or a ship's plaque.T..
Liverpool University Royal Naval Unit badge, also known as a ship's crest or a ship's plaque.T..
Bristol University Royal Naval Unit badge, also known as a ship's crest or a ship's plaque.The..
Birmingham University Royal Naval Unit badge, also known as a ship's crest or a ship's plaque.The&n..
Royal Fleet Auxiliary Tidespring ship badge, also known as a ship's plaque or a ship's crest.The RF..
Oxford URNU crest, also known as a plaque or a badge.The Oxford URNU plaque features a golden ancho..
United Kingdom Maritime Component Command badge, also known as a plaque or a crest.The UKMCC badge .. 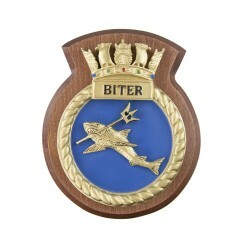 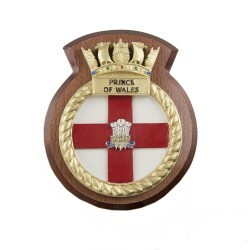 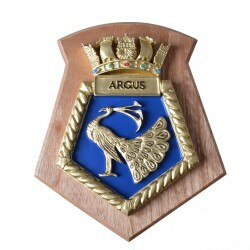 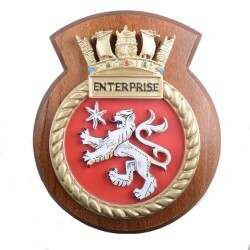 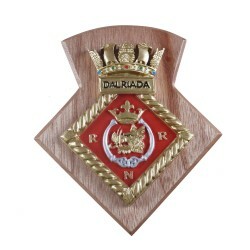 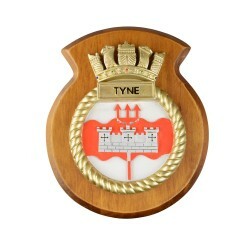 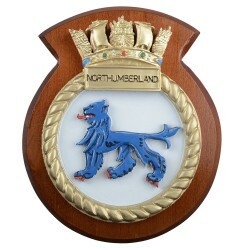 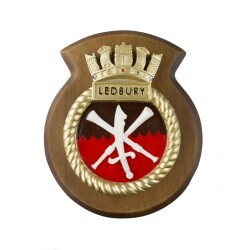 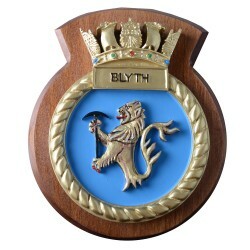 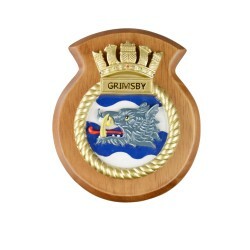 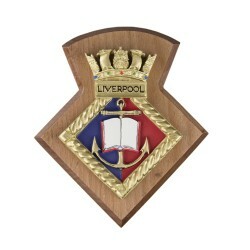 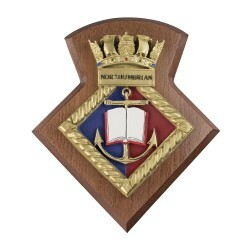 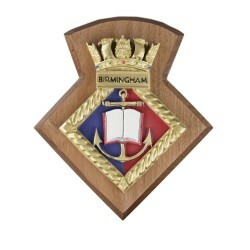 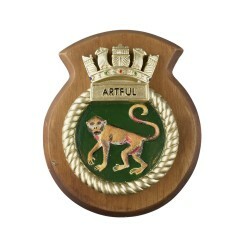 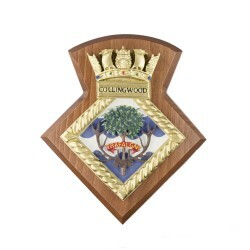 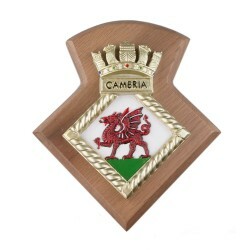 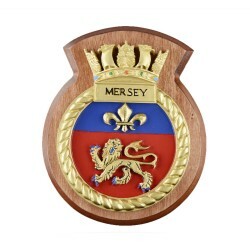 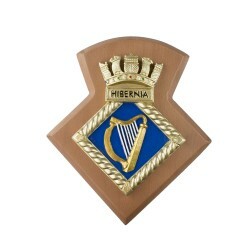 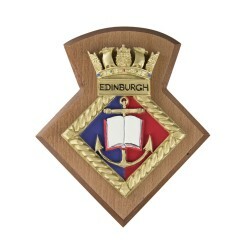 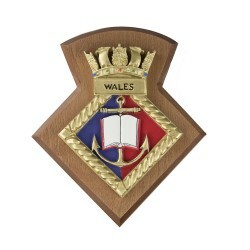 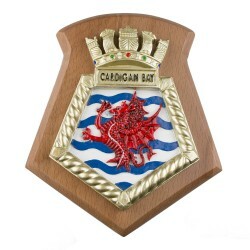 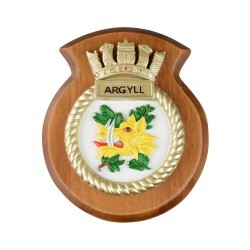 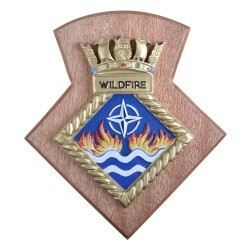 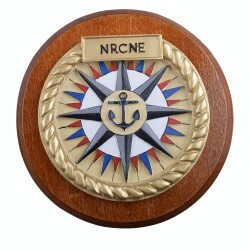 Naval Regional Commander Northern England crest, also known as a plaque or a badge.The Naval Region..
Commodore Amphibious Task Group crest, also known as a plaque or a badge. 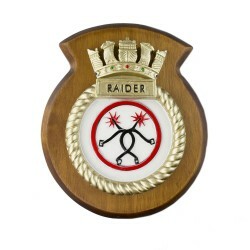 The Commodore Amphib..
HMS King Alfred RNR unit crest, also known as a unit plaque or a unit badge.The HMS King Alfred RNR..
HMS Wildfire RNR unit crest, also known as a unit plaque or a unit badge.The HMS Wildfire RNR unit ..
Royal Fleet Auxiliary Argus ship badge, also known as a ship's plaque or a ship's crest.The RFA Arg..
43 Commando Fleet Protection Group unit badge, also known as a plaque or a crest. 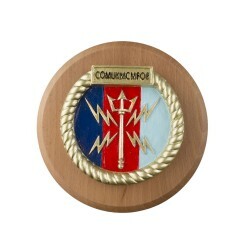 The 43 CDO F.. 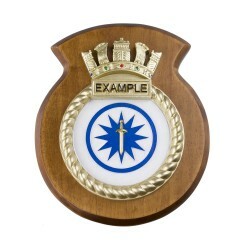 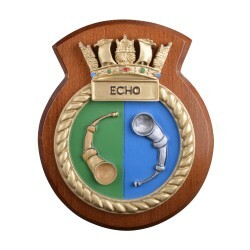 Flag Officer Sea Training badge, also known as a plaque or a crest.The FOST badge features an Engli..
Royal Fleet Auxiliary Gold Rover ship badge, also known as a ship's plaque or a ship's crest.The RF..
42 Commando Royal Marines unit badge, also known as a plaque or a crest.The 42 CDO RM units badge i..
HMS Ambush ship badge, also known as a plaque or a crest.The HMS Ambush ship's badge features a gre..
HMS Victorious Submarine crest, also known as a Submarine plaque or a Submarine badge.The HMS Victo..
HMS Scott ship badge, also known as a ship's plaque or a ship's crest.The HMS Scott ship's badge fe..
HMS Enterprise ship badge, also known as a ship's plaque or a ship's crest.The HMS Enterprise ship'..
HMS Echo ship badge, also known as a ship's plaque or a ship's crest.The HMS Echo ship's badge feat..
HMS Gleaner ship badge, also known as a ship's plaque or a ship's crest.The HMS Gleaner ship's badg..
HMS Scimitar ship badge, also known as a ship's plaque or a ship's crest.The HMS Scimitar ship's ba..
HMS Severn ship badge, also known as a ship's plaque or a ship's crest.The HMS Severn ship's badge ..
HMS Mersey ship badge, also known as a ship's plaque or a ship's crest.The HMS Mersey ship's badge ..
HMS Clyde ship badge, also known as a ship's plaque or a ship's crest.The HMS Clyde ship's badge fe..
HMS Ramsey ship badge, also known as a ship's plaque or a ship's crest.The HMS Ramsey ship's badge ..
HMS Pembroke ship badge, also known as a ship's plaque or a ship's crest.The HMS Pembroke ship..
HMS Middleton ship badge, also known as a ship's plaque or a ship's crest.The HMS Middleton ship's ..
HMS Atherstone ship badge, also known as a ship's plaque or a ship's crest.The HMS Atherstone ship'..
HMS Sutherland ship badge, also known as a ship's plaque or a ship's crest.The HMS Sutherland ship'..
HMS Somerset ship badge, also known as a ship's plaque or a ship's crest.The HMS Somerset ship's ba..
HMS Northumberland ship badge, also known as a ship's plaque or a ship's crest.The HMS Northumberla..
HMS Monmouth ship badge, also known as a ship's plaque or a ship's crest.The HMS Monmouth ship's ba..
HMS Duncan ship badge, also known as a ship's plaque or a ship's crest.The HMS Duncan ship's badge ..
HMS Defender ship badge, also known as a ship's plaque or a ship's crest.The HMS Defender ship's ba..